[Fig. 1] The Soldier. From NRS 313 [7/5546 letter 16/6921]. [Fig. 2] The Soldier, p.2. From NRS 313 [7/5546 letter 16/6921]. [Fig. 3] Direct Action, December 1916. From NRS 905 [5/7442 letter 16/40328]. [Fig. 4] Direct Action, December 1916. From NRS 905 [5/7442 letter 16/40328, p.2]. [Fig. 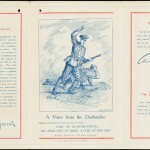 5] Direct Action, December 1916. From NRS 905 [5/7442 letter 16/40328, p.3]. [Fig. 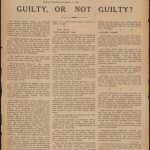 6] ‘Guilty, or not guilty’, The Australian Worker. From NRS 313 [7/5546 letter 16/6921]. 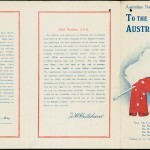 Printing firms throughout New South Wales may well have benefited from the increased business as they were called upon to produce a variety of printed items for the various conscription causes. 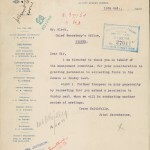 Many groups had their own letterheads, which meant that every letter sent was also a vehicle for propaganda. [Fig. 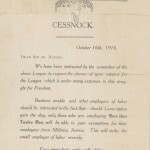 7] No-conscription campaign letter, 1916. From NRS 905 [5/7392 16/229]. [Fig. 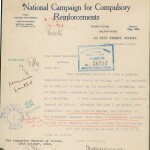 8] National Referendum Campaign Committee, 1916. From NRS 905 [5/7392 letter 16/229]. [Fig. 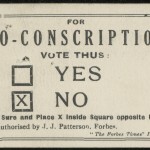 9] Anti conscription handbill, 1916. From NRS 10923 [7/5592 letter 16/28832]. [Fig. 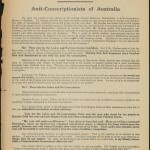 10] Anti conscription League of Australasia handbill. From NRS 10923 [7/5593 F1]. [Fig. 11] How to vote card, 1916. From NRS 905 [5/7441 letter 16/33387]. [Fig. 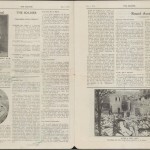 12] Report from Detective 1st Class N Moore, 1916. From NRS 905 [5/7442 letter 16/40328, p.1]. [Fig. 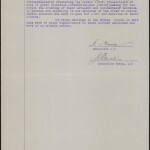 13] Report from Detective 1st Class N Moore, 1916. From NRS 905 [5/7442 letter 16/40328, p.2]. 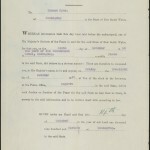 The Australian Government did not give up on the idea of conscription after the first plebiscite, holding a second plebiscite on 20 December 1917. Despite more emotional pleas for conscription from key leaders in government [Fig. 14-15], the ‘no’ vote was even higher the second time around. (16) It was a clear message from the people of New South Wales and Australia. [Fig. 15] Australian Natives’ Association of NSW pamphlet, 1915. From NRS 12060 [9/4705 letter 15/7546, p.2]. [Fig. 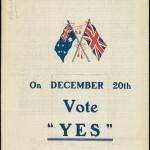 16] Vote Yes leaflet. From NRS 12060 [9/4762 letter 15/7546, p.4]. 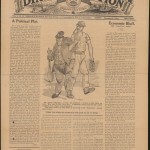 The conscription debate caused great division in the community both before and after the plebiscites. In the city there was more chance for breathing space between those with opposing views, but in small rural towns, where there was only one pub and one general store, locals had little choice but to rub shoulders with each other. One Friday afternoon in October 1916, a few of the locals were having a beer at the Commercial Hotel in Goolagong (now Gooloogong) in Central Western NSW. The question, ‘Are you a conscriptionist?’ was all it took to set things off. After the brawl was over, Messrs Haydon, McKenzie, Edmunds and Ryan all found themselves summonsed to the Eugowra Court of Petty Sessions, where the magistrate likened them to a ‘pack of dingoes’. (17) They faced various charges including assault, riotous behaviour, and threatening words such as ‘I’ll have you, you coot conscriptionist’. [Fig. 17] Police summons, George Haydon. From NRS 2981[38/31]. [Fig. 18] Police summons, John Haydon. From NRS 2981[38/31]. [Fig. 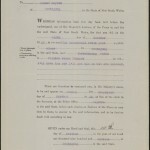 19] Police summons, William James Edmunds. From NRS 2981[38/31]. [Fig. 20] Police summons, Thomas Ryan. From NRS 2981[38/31]. [Fig. 21] Police summons, Samuel McKenzie. From NRS 2981[38/31]. [Fig. 22] Police summons, Thomas Haydon. From NRS 2981[38/31]. [Fig. 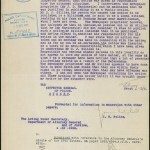 23] Police letter, November 1916. From NRS 313 [7/5545 letter 16/6538]. [Fig. 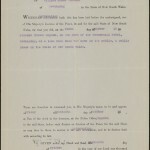 24] Public notice, The Tweed Call, 1916. From NRS 313 [7/5545 letter 16/6538]. Conscription was a spectre that had been temporarily put to rest, but it would raise its head again during the next World War. (1) ‘Country Press Favor Conscription’, Canowindra Star and Eugowra News, 20 October 1916, p. 4, http://nla.gov.au/nla.news-article118103598; Gilchrist, Catie, ‘Socialist Opposition to World War I’, Dictionary of Sydney, 2014, http://dictionaryofsydney.org/entry/socialist_opposition_to_world_war_i ,(accessed 17 August 2015). 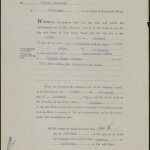 (2) State Archives New South Wales: Colonial Secretary; NRS 905, Letters received [5/7439] 16/37686, Report of Inspector General of Police on anti-conscription movement in Broken Hill 20/8/1916. 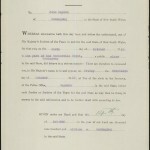 (3) SANSW: Police Department; NRS 10923, Special Bundles [7/5588]; ‘W. 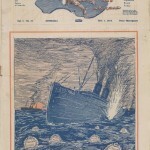 D. Barnett’s Conviction’, Barrier Miner, 18 December 1916, p. 4, http://nla.gov.au/nla.news-article45410643. 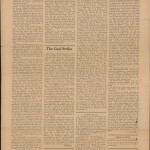 (4) Beattie, Bill, ‘Memoirs of the I.W.W.’, Labour History, 13 (1967): 33-39, https://libcom.org/files/Memoirs%20of%20the%20I.W.W.pdf, (accessed 3 August 2015); SANSW: Government Printing Office; NRS 4415, Correspondence with other Government departments [1/193] 15/D4528, ‘The Truth About German Atrocities’. (5) Commonwealth Electoral Act 1902 (Cth), s.180; Military Service Referendum Act 1916 (Cth), s.12(2); NRS 905 [5/7441] 16/38387, Report from Inspector General of Police; NRS 905 [5/7441] 16/38386, Letter from Constable 1st Class James Jenkinson, Police Station Forbes. 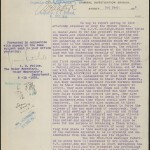 (6) NRS 905 [5/7439] 16/37727, Report from Sergeant Thomas Robertson re: meetings held in the Sydney Domain; NRS 905 [5/7439] 16/37666, Letter from Inspector General of Police re: Anti-Conscription meeting in the Sydney Domain; NRS 905 [5/7392] 16/229, Report from Metropolitan Superintendent re: Conscription meetings held in No. 10 Division. 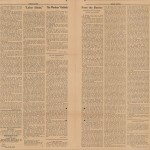 (7) ‘Spasms’, Direct Action, 24 Feb 1917, Issue No. 110, , p.4, http://www.jura.org.au/files/jura/DirectAction-No110-24Feb1917.pdf. (8) NRS 905 [5/7439] 16/37666; NRS 905 [5/7441] 16/38384, Report on Narrabri anti-conscription meeting; NRS 905 [5/7439] 13/37686, Report from Inspector General of Police re: anti-conscription movement at Broken Hill. (9) Beattie, Bill, p.37; NRS 905 [5/7439] 16/37666. (10) NRS 905 [5/7439] 16/37666. 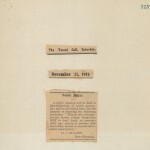 (11) ‘In Australia’, Barrier Miner, 4 September 1916, p. 2, http://nla.gov.au/nla.news-article45427599; ‘Meeting in the Domain’, Barrier Miner, 2 October 1916, p. 2, http://nla.gov.au/nla.news-article45411866; NRS 905, [5/7392] 16/229, Letter from National Referendum Campaign Committee. (12) NRS 905 [5/7439] 16/37666 & 16/37727. (13) ‘Conscription Referendum’, Swan Hill Guardian and Lake Boga Advocate, 29 March 1917, p. 2, http://nla.gov.au/nla.news-article91132991. (14) Commonwealth of Australia. (2011). Parliamentary Handbook for the 42nd Parliament, Part 5: Referendums and Plebiscites, pp. 398-399, http://www.aph.gov.au/About_Parliament/Parliamentary_Departments/Parliamentary_Library/Parliamentary_Handbook (accessed 14 August 2015). (16) Commonwealth of Australia, pp. 398-399. (17) ‘Eugowra Police Court’, Canowindra Star and Eugowra News, 3 November 1916, p. 6, http://nla.gov.au/nla.news-article118103687; SANSW: Eugowra Court of Petty Sessions; NRS 2981, Depositions [38/31] Summons Case No. 51/1916-63/1916. (18) ‘Advertising’, Canowindra Star and Eugowra News, 27 October 1916, p. 5, http://nla.gov.au/nla.news-article118103604; ‘An Interesting Assault Case’, Leader, 27 November 1916, p. 1, http://nla.gov.au/nla.news-article117818124; SRNSW: Department of Attorney General and of Justice; NRS 313, Letters received [7/5545] 16/6558, Letter from Inspector General of Police re: notice in Tweed Call newspaper; ‘Alleged Assault At Teven’, The Richmond River Express and Casino Kyogle Advertiser, 9 January 1917, p. 2, http://nla.gov.au/nla.news-article121278974. (19) Turner-Graham, E. (2009). 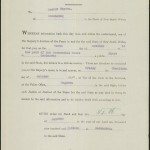 ‘Conscription, World War I, 1914-1918’, in Museum Victoria Collections, http://collections.museumvictoria.com.au/articles/2823, (accessed 21 August 2015).